Berry Campbell Gallery is pleased to announce its annual exhibition, SUMMER SELECTIONS, from July 9 through August 17, 2018. Berry Campbell will present a work from each of the gallery’s represented twenty-eight artists/estates. Also, included in the show will be additional works from the gallery’s inventory by Elaine de Kooning, Paul Jenkins, Larry Poons, and Frank Stella. This exhibition offers a chance to view a wide variety of paintings and works on paper by important mid-century and contemporary artists. 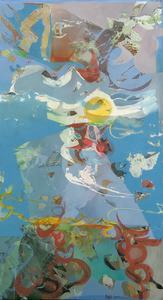 EDWARD AVEDISIAN was born in Lowell, Massachusetts in 1936 and attended the School of the Museum of Fine Arts, Boston. 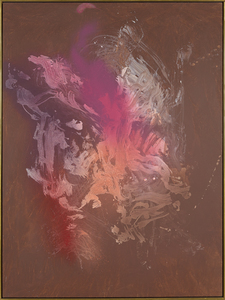 After moving to New York City in the early 1960s, he joined the dynamic art scene in Greenwich Village, frequenting the Cedar Tavern on Tenth Street, associating with the critic Clement Greenberg, and joining a new generation of abstract artists, such as Darby Bannard, Kenneth Noland, Jules Olitski, and Larry Poons. Avedisian was among the leading figures to emerge in the New York art world during the 1960s. An artist who mixed the hot colors of Pop Art with the cool, more analytical qualities of Color Field painting, he was instrumental in the exploration of new abstract methods to examine the primacy of optical experience. WALTER DARBY BANNARD, a leader in the development of Color Field Painting in the late 1950s, was committed to color-based and expressionist abstraction for over five decades. During his undergraduate years at Princeton University, he joined fellow students, the painter Frank Stella and the critic and art historian Michael Fried, in conversations that expanded aesthetic definitions and led to an emphasis on opticality as the defining feature of pictorial art. His early paintings were inspired by the art of William Baziotes and Clyfford Still, but by the late 1950s, Bannard abandoned this expressionist style embracing reductionism that advanced certain elements natural to painting – open space, continuous surface, symmetry, and affective color. 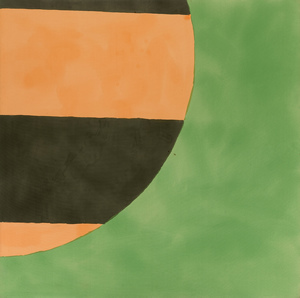 His new paintings, from the late 1950s to the mid-1960s, contained few forms and insisted that relational design could be displaced by a kind of straightforward presentation of effect. Throughout his four-decade-long career, STANLEY BOXER broke through the barriers that often divided the artists of his day. 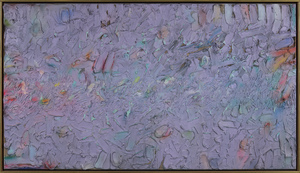 In the 1960s, he was deemed a Color Field painter, but at the time he was already moving toward the material specificity of process art, building dense surfaces with unexpected additives, such as sand, glitter, sawdust, wood shavings, and dressmaker’s beads. However, Boxer stopped short of letting his materials speak for themselves. More interested in the end result than in his process or materials, in his art, he expressed his love for intense optical he sought to create new forms that could excite the eye. Boxer found a common ground among the competing ideologies of his time, while maintaining his distinctive artistic identity. 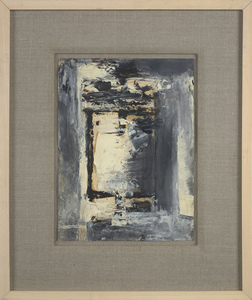 His paintings, sculptures, and collages can be linked to contemporary currents, but throughout he maintained a commitment to creating surfaces characterized by intense radiance and nuance, designed with “a kind of choreography of material,” as described in Arts Magazine by Judith Van Baron in 1974. 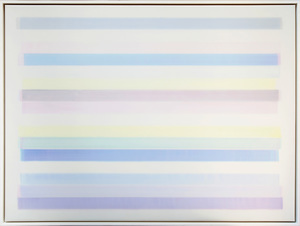 During his forty-year career, DAN CHRISTENSEN employed a painting method involving a considerable amount of improvisation and experimentation. However, his work had a logical and systematic evolution. Using the visual language of abstraction—from Abstract Expressionism through Color Field Painting and Minimalism—he pursued particular lines of inquiry until he felt he had exhausted them. He then changed the variables of his art to move in new directions. Yet, in doing so, he often doubled back, revisiting aspects of his earlier work to rework old themes and create new combinations. Like many artists before him—Picasso and Pollock come to mind—through such recycling, he gave layered resonance to his art. Over the last decade, ERIC DEVER has pursued intensely focused investigations into methods and materials, evolving gradually with new, sensitively executed, intimate works of art. For several years, Dever limited his palette to white—Zinc and Titanium white—enabling him to uncover a white spectrum ranging from opacity to translucency. In the past, his compositions were largely geometric, including circles graded from dark to light, which included the introduction of black, widening the range and force of the work. Paintings are explorations through and beyond formal inquiry. 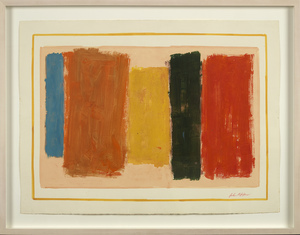 His methods, while still conceptual, enable him to let the energetic qualities of color, line, and form emerge. 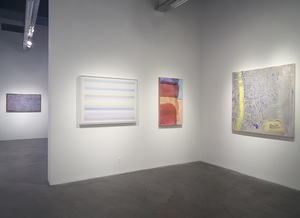 Since the early 1990s, Dever’s work has been included in numerous one-person and group exhibitions throughout New York, as well as in Chicago, Ohio, Texas, New Mexico, and France. Committed to abstraction throughout a career that lasted fifty years, PERLE FINE maintained high ideals, never adopting a method to follow a trend or compromising when her work was outside the mainstream. Although she experienced the barriers that limited the opportunities for women artists in the era—especially those who entered into the macho milieu of Abstract Expressionism—she held to her belief that it was painting itself that mattered, not who had created it. 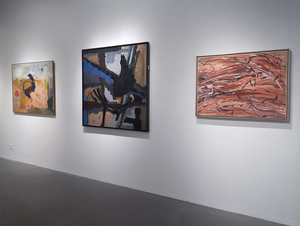 However, Fine’s achievement and that of other women of her time has recently been given serious attention, such as in the June–September 2016 exhibition, Women of Abstract Expressionism, held at the Denver Art Museum. Abstract Expressionist JUDITH GODWIN, uses a language of abstract form to respond with unbowed directness and passion to life and nature. For Judith Godwin, painting “is an act of freedom and a realization that images generated by the female experience can be a powerful and creative expression for all humanity.” Godwin’s aim throughout her career has been to “emphasize what is important by painting the image of my feelings on canvas—to accept my feelings honestly, and not [to] falsify.” Through her studies with Hans Hofmann, her long association with Martha Graham and Graham’s expressive dance movements, her participation in the early burgeoning of Abstract Expressionism, and her love for Zen Buddhism and gardening, Godwin has forged a personal and unique career path. BALCOMB GREENE was one of the leaders of the early American Modernist movement of the 1930s. In 1935, he was included in the ground-breaking exhibition, “Abstract Painting in America” at the Whitney Museum of American Art. Along with Ilya Bolotowsky, Charles Green Shaw and Burgoyne Diller, he founded the American Abstract Artists group in 1936. Balcomb Greene’s pure geometric style of juxtaposing hard edge shapes and lines against planes of color made the 1930s one of the most important periods in American painting, thus leading the way for the Abstract Expressionist painters who followed in the 1950s. An artist whose work is embedded in a philosophical and theoretical framework, KEN GREENLEAF is a committed modernist, working in the minimalist tradition. In recent years, his emphasis has been on creating streamlined paintings on shaped supports and paper collages, in which he continues the engagement with relations between shapes and materials that has been the central focus of his art. 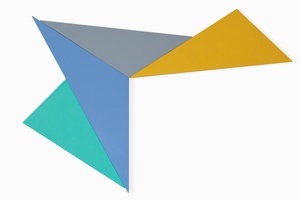 While comprised of geometric forms, Greenleaf’s art has a freeform aspect, forcing us to mentally organize what we’re seeing into “ideas.” He perceives the edges of his shaped surfaces, the color of his raw canvases, and the borders of his painted areas as “direct essays in understanding how we apprehend what we see and how we recognize what is real.” The tension between flatness and the feeling of desire for illusion in Greenleaf’s art brings us to a place between raw sensation and the conceptual, which is ultimately a metaphysical one. Greenleaf’s art has been shown widely at galleries and museums since the early 1970s. A first-generation action painter, RAYMOND HENDLER started his career as an Abstract Expressionist in Paris, as early as 1949. In the years that followed, he played a significant role in the movement, both in New York, where he was the youngest voting member of the New York Artist’s Club and a friend of Franz Kline, Willem de Kooning, Jackson Pollock, and Harold Rosenberg, and in Philadelphia, where he ran an avant-garde gallery between 1952 and 1954. Over the course of his career, his work evolved from abstract gestural works to jubilant, abstracted words and shapes, which revealed a freshness, vitality, and high-spiritedness unparalleled in the New York post-war art world. In her reduction of painting to its physical essence, JILL NATHANSON belongs to the Color Field legacy, but her immersive and sensual paintings stand in a category of their own. Consisting of unusual hues of overlapping layers of variable translucency, they create emotionally nuanced experiences with yet enough tension to engage our contemplation. Eschewing the gestural impulsiveness of Abstract Expressionism, Nathanson employs a systematic, multistep process. 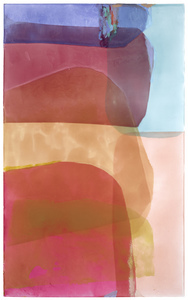 She starts with sheets of translucent color—files she makes and prints from the computer—which she overlays to produce new colors, cutting and combining until she finds relationships that spark the visual responses she seeks. She then scales up her studies for transference to finished works. In her laser focus on the physical act of painting, and her employment of a wide array of uncommon hues, she brings to mind the work of Titian and glazing traditions. CHARLOTTE PARK graduated from the Yale School of Art, New Haven, Connecticut in 1939. 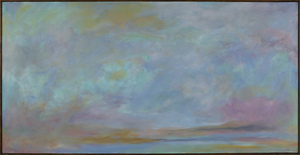 Charlotte Park’s important and distinct contribution to the Abstract Expressionist movement during its early years has received increased attention from art historians, critics, and collectors for her muscular and brilliantly colored canvases with thickly painted surfaces often achieved by scraping the paint with a palette knife. In the early 1950s, Park worked in a monochrome palette, which liberated her to focus on form. By the mid-1950s, she reintroduced color into her art, creating charged relationships with hot oranges, greens, and brilliant blues. Uniting painting and drawing, she formed a vocabulary featuring clustered loops, black curvilinear forms that both define and liberate. Figurative and still life elements and suggestions of the natural world seem to taunt and loom in her art but are either suppressed or diffused. Park was a naturalist and kept extensive and exhaustive journals and notes about various leaves, bird sightings, and changes to their grounds or nearby beaches. 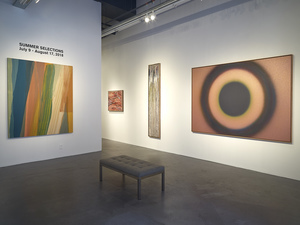 Canadian Color Field painter, WILLIAM PEREHUDOFF has exhibited an Apollonian/Dionysian opposition in his work, reflected in his tendency toward the harmonious and rational that he then had the courage to subvert with “seductive, syncopated color.” Many of his paintings evoke musical harmonies and reverberations, while they are suggestive of light flowing across the open Canadian plains. Recalled in 2013 by Timothy Long, head curator of Saskatchewan’s Norman MacKenzie Art Gallery, as “one of the greatest colorists this province and Canada has produced,” Perehudoff was a friend of and is regarded as the heir to Jack Bush, as Canada’s most important Color Field painter. Perehudoff’s diverse art, both vibrant and cerebral, continues to influence a younger generation of artists. When JON SCHUELER arrived in New York in August of 1951, he initially resided in the studio of Clyfford Still, with whom he had recently studied at the California School of Fine Arts in San Francisco. In New York, Schueler quickly became part of the downtown art scene. His circle of friends included Franz Kline, Mark Rothko, Ad Reinhardt (who he had known in California), Raymond Parker, and Barnett Newman. Frequenting the Cedar Bar, becoming part of the Club, and imbibing the heady and adventurous spirit of the time, he created large-scale canvases, rendered gesturally with the palette knife. These were shown at the historic Stable Gallery, run by Eleanor Ward, in 1954 and at Leo Castelli’s brand new gallery in 1957 (Schueler’s was the first solo show at the gallery). Along with such artists as Joan Mitchell, Grace Hartigan, and James Brooks, Schueler became known as one of the most prominent figures in the second generation of Abstract Expressionists, who expanded abstraction in new directions, often embracing the natural world. Born near Uniontown, Pennsylvania in 1917, SYD SOLOMON had a long and varied training as an artist. After high school, Solomon was enrolled at the Art Institute of Chicago from 1935 to 1938. He soon joined the war effort prior to the attack on Pearl Harbor, and he was able to hone his artistic skills by creating camouflage to disguise and protect the airfields being built by his battalion. 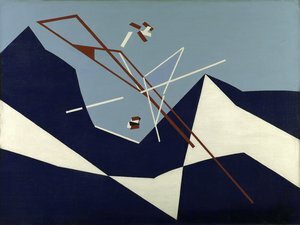 Solomon often remarked that aerial reconnaissance during World War II influenced his ideas about abstract art. Solomon’s work from the 1970s seek to evoke the forces of nature through abstract expressionist gestures, and he is best known for his challenging color, which—while including the palette of his peers—extended the range to teals, pinks, and sea greens, among others. This spectrum of color was owed to the “polaroid,” a term he coined to describe the color he experienced working in natural environments on Long Island’s East End and Florida’s Gulf Coast. Solomon was known as visionary in his use of new mediums. 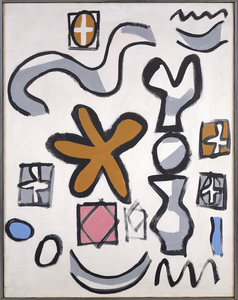 Victor D’Amico, the first Director of Education for the Museum of Modern Art, recognized Solomon as the first artist to use acrylic paint in the 1950s. In addition, he was one of the first artists to use aerosol sprays and resists, a technical ability that allowed for groundbreaking achievements in abstract painting. Throughout Solomon’s career his works were acclaimed for their visionary and romantic expression. Throughout a career lasting over fifty years, YVONNE THOMAS blended the intuitive freedom of Abstract Expressionism with the symbolic language of form and color. 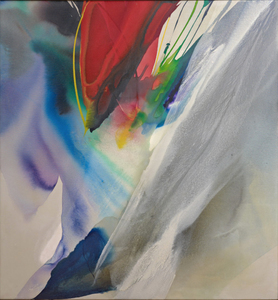 As she stated: “Variations on these two movements have continued and merged into a sense of adventure and invention.” For Thomas color was the “strongest joy and enigma,” and she used an expressive range of pigments in works that progressed logically in series, often conveying her emotional responses to the spirit of nature. Dedicated with serious focus to art from the late 1930s until her death at age 95, Thomas was one of few women to be part of the early generation of Abstract Expressionists. A member of the intimate inner circle of artists who were at the heart of the movement, she attended the historic Subjects of the Artist School (1948–49) and was invited to join the exclusive Artist’s Club (known as “The Club”). 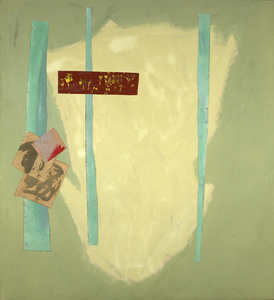 She exhibited in prominent galleries of the day—including Stable, Tanager, and Betty Parsons—and was represented in all five of the New York Paintings and Sculpture Annuals (held in a temporary gallery on New York’s 9th Street) as well as the seminal 9th Street Show of 1951. A distinctive aspect of Thomas’s identity is that she spent her first twelve years in her native France and always felt a connection with the art and culture of Europe. This background gave her a special closeness with the other émigré artists of the time—Willem de Kooning and Marcel Duchamp were among her close friends—but she always considered herself American and saw her work as a manifestation of the place where she lived and worked. SUSAN VECSEY was born in New Jersey and currently lives and works in both New York City and East Hampton, New York. She earned her Bachelor of Arts from Barnard College, Columbia University, New York and her Masters of Fine Art from the New York Studio School of Drawing, Painting and Sculpture, studying under Graham Nickson. A painter interested in creating lyrical and poetic themes, Susan Vecsey uses iconic imagery derived from nature. References to representational imagery are just a starting point however, and serve as a means to convey certain emotions and explore color, form, and shape. Vecsey’s elegant and minimal abstract compositions are composed soft lines, ethereal atmospheres, and fields of raw linen and also includes works large in scale, distinguished through a heightened sense of drama characterized by bold geometric shapes, strong diagonals, and opulent color. JAMES WALSH was born in 1954 in Newark, New Jersey. He earned his Bachelor of Arts from Rutgers University in New Brunswick and went on to earn his Masters of Fine Art from Syracuse University in New York. An abstract expressionist, he is known best for his paintings where he uses acrylic paint as his medium to create three-dimensional works of art pleasing to the eye. According to art critic Franklin Einspruch, “his palette has moved from smoky and dour to cheerful, even tart, and his painterly command, judgment and taste have become exceptionally refined. Somehow the paint sloshes over the canvases without looking incidental. They are as orderly and yet unpredictable as the sea”. Walsh has been represented by Berry Campbell Gallery for 5 years. A highly respected New York artist who has been in numerous national and international exhibitions, JOYCE WEINSTEIN creates dynamic works in which abstraction obscures hints of the natural world. Nature is most apparent in her use of light, which she creates using a combination of techniques: washes, impasto, and contrasts of texture and hue. Weinstein uncovers dynamic balances among these opposites, so that her work achieves a fine equilibrium of both spontaneity and control. Born in New York City in 1931, she studied at both the City College of New York and the Arts Students League. At the Arts Students League, she met Stanley Boxer, whom she would later marry. Her first solo exhibition was at the Perdalma Gallery, New York in 1953 and she would go on to have a series of solo exhibitions at the gallery throughout the 1950s. 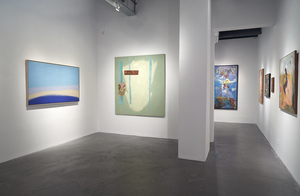 Weinstein has exhibited nationally and internationally in solo exhibitions in Houston, Chicago, Minneapolis, Naples, Florida, Canada, and Germany. Her work has been included in a number of exhibitions at institutions such as the Museum of Modern Art, New York; Brooklyn Botanic Gardens, Steinhardt Conservatory; New York Cultural Center Museum; Pace University Art Gallery, New York; Queens College, New York; the Queens Museum, New York; the Hudson River Museum, Yonkers, New York; the Cork Gallery, Lincoln Center, New York; Weatherspoon Art Museum, University of North Carolina, Greensboro; the Kresge Art Center, East Lansing, Michigan; the Edmonton Art Museum, Canada; the Centro de Creacio Contemporia, Barcelona; the Cologne Art Fair, Germany, among others. Born in Pleasantville, New Jersey in 1926, abstract expressionist painter, FRANK WIMBERLEY attended Howard University and studied with James Porter, Lois Mailou Jones and James Wells. While a student, he also played jazz (a consistent theme in his work) and later became friends with musicians such as Miles Davis, Ron Carter, and Wayne Shorter. Frank currently lives and works from studios in New York City and in Sag Harbor, Long Island. Frank Wimberley has had numerous solo and group gallery and museum exhibitions, including June Kelly Gallery, New York; Guild Hall Museum, East Hampton, New York; Parrish Art Museum, Water Mill; and the Heckscher Museum of Art, Huntington, New York. LARRY ZOX, a painter who played an essential role in the Color Field discourse of the 1960s and 1970s, is best known for his intensely and brilliantly colored geometric abstractions that question and violate symmetry. Zox’s robust paintings reveal a celebrated artist and master of composition who explored and challenged the possibilities of Post-Painterly Abstraction and Minimalist pictorial conventions. 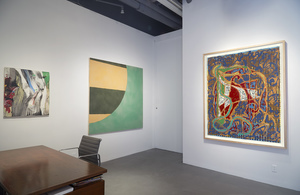 Zox began to receive attention in the 1960s when he was included in several groundbreaking exhibitions of Color Field and Minimalist art, including “Shape and Structure” (1965), organized by Henry Geldzahler and Frank Stella for Tibor de Nagy, New York, and “Systemic Painting” (1966), organized by Lawrence Alloway for the Solomon R. Guggenheim Museum, New York. In 1973–1974, the Whitney’s solo exhibition of Zox’s work gave recognition to his significance in the art scene of the preceding decade. In the following year, he was represented in the inaugural exhibition of the Hirshhorn Museum and Sculpture Garden, Washington, D.C., which acquired fourteen of his works. His paintings have been exhibited and collected by major museums worldwide.